"Being in partnership with Paul has its benefits because it is another mind to run ideas... I really am enjoying it and love being my own boss." Combining a strong and well established corporate image with extensive expertise and know-how relating to the fish & chip shop sector, The Frying Squad has established five outlets with plans for a further 14 across Ireland and Great Britain by the end of 2012. Franchise owners enjoy the benefit of the company's commitment to providing training and ongoing support, factors which encourages former ambulance technicians Thomas McStocker (pictured below) and Paul Hamilton to go into partnership to open a location in Carrickfergus. Thomas and Paul, who spent a number of years protecting the public in Derry and Magherafelt respectively, were searching for a business to run together when they came across The Frying Squad in the early days of the company's franchise expansion. Impressed by the professionalism of the concept, plus the strength of the franchise package and support on offer, the pair opened the company's second franchise location on Middle Road, Carrickfergus. "It was too good an opportunity to pass up," says Thomas. "I had always fancied owning a fish and chip shop. It's been hard work and quite stressful at times but after working for eight years in the ambulance service it is easier to cope with. 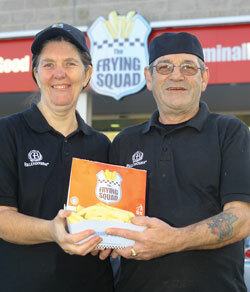 The pair's focus on delivering excellent customer service was one of the attractions for The Frying Squad in granting them the franchise, as their recent 'Five Star' rating in local food hygiene rating system 'Scores on the Doors' attests. "Over recent years expectations have changed, people demand the best and providing excellent customer service is essential to keep customers and attract new ones," Thomas reflects. "Doing the best you can and providing customers with a good experience every time is essential. So far it is going well, we have developed a strong customer base. You have to put the work in and a six day week is not unusual, but we are starting to see the rewards and are getting busier especially at teatime and lunchtime every day." 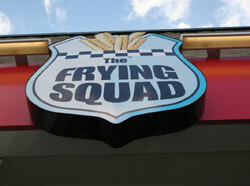 As well as the traditional meals you would expect, The Frying Squad prides itself on the extensive menu it offers. "Fish and chips are our biggest sellers," Thomas confirms. "However we also do burgers, baked potatoes, chicken goujons and filled sodas. One of our more unusual products is our taco chip which is a portion of chips with spicy meat on the top. It has proven very popular. The Frying Squad is constantly reviewing the menu to ensure we are bringing customer's a varied choice. "Being in partnership with Paul has its benefits because it is another mind to run ideas or problems past before making decisions on anything. Paul is very level headed and thinks carefully before he does anything. I really am enjoying it and love being my own boss." 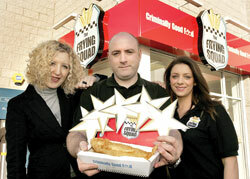 It's not just newcomers to the food sector that are impressed with The Frying Squad's franchise opportunity. After years of running their own catering company, husband and wife team Agnew and Barbara Monteith (pictured above) noted the potential of the company through their friendship with Founder Micheal Neill and opened a franchise outlet in Belfast Road, Bangor. "We had been doing outside catering and the catering for Shorts Sports and Social Club for years," says Barbara. "But slowly the profits began to decrease and we realised it was time for a change. After discussing the proposition over with Michael, we knew that the franchise was already a success and it just felt that with our experience in the catering industry it would be perfect for us. "We are thoroughly enjoying the experience. As we had been running our own business for over 20 years, being able to continue as our own boss was a key factor in taking the franchise. We're excited about the future and plan to optimise our sales to grow the business." Opportunities exist across Ireland and Great Britain and The Frying Squad is looking for franchise owners that can commit to excellence and growth. In addition to experience and drive you will need to be able to motivate others, manage teams and maintain effective relationship with staff, The Frying Squad Management and customers. If you feel that you have the drive, commitment and enthusiasm to run your own business according to a proven and successful business format, get in touch today to find out more about this exciting opportunity.